Blue Bus of Kabul Brings Joys of Reading to Afghan Children - Integration Through Media ....! 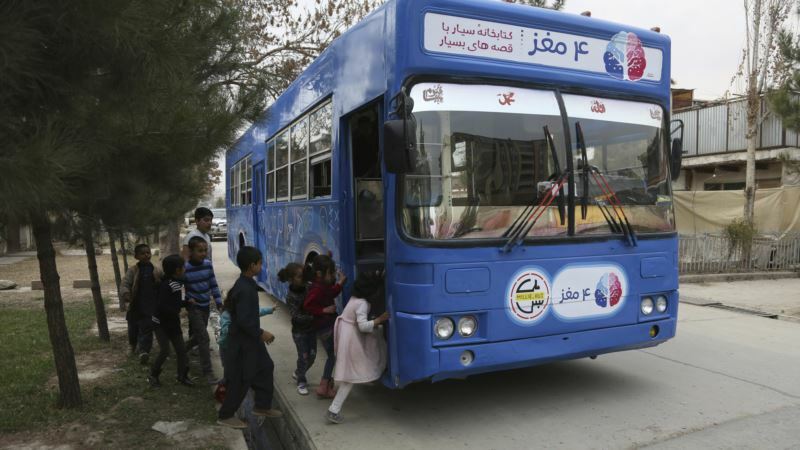 (VOA): The children of Kabul love the blue bus – they rush toward it every time it pulls into their street, eager to come on board, their young eyes brimming with excitement. But it's no ordinary bus. Its name is Charmaghz, the Dari word for Walnut, and it's a library on wheels – the first such enterprise in Afghanistan's war-battered capital. From sunrise to sunset, the bus drives around Kabul's neighborhoods, stopping in each place for a couple of hours at a time. The library was the initiative of Freshta Karim; a 25-year-old who recently got her master's degree in public policy from the University of Oxford, England. She wanted to give Kabul's children something badly missing in her own childhood – the chance to widen one's horizons, free of the shadow of war and poverty. Two weeks into the project, she is thrilled by the kids' fondness for the bus. “The first day I came on the bus, I was so happy that I didn't want to leave and go home,” Marwa said, smiling. Karim and her team believe it's important for the children to choose the books that appeal to them freely and keep reading. It's the best way to develop critical thinking, she says – and hopefully also a step toward combatting Afghanistan's 62 percent illiteracy rate. For 10-year-old Sameer, books are his new friends – and a source of knowledge to pass on.